The Microsoft search engine Bing's front page features one of Belize's landmark locations on it's front page today: the Blue Hole! 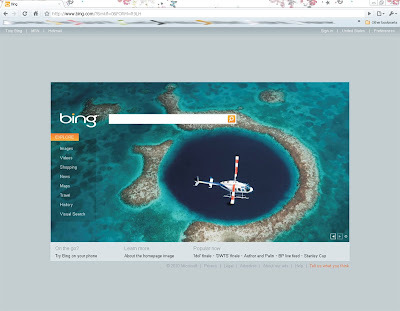 Bing features a different image on their homepage every day, with four 'hotspots' of information on the image. Just another little boost for Belize!! According to Bing, if you miss the previous day's image or wish to see it again and again, click on the arrows next to the Copyright (©) symbol to scroll through the past 7 days of homepages. Interaction is the same as when it was the feature page!